This wooden bowl from Meigu county was probably made around 1920. Inside of bowl is painted red which extends over the rim. There are three design fields on the outside placed over black background using red and yellow paints. The design fields show floral and geometric patterns executed in yellow over red, outlined by thin black lines and dots over yellow. Bottom of bowl shows a yellow center surrounded by a red circle over black. Bowl shows cracking and some areas where paint has peeled off. Turned on a pedal lathe, painted with black lacquer. The designs painted with red and yellow stone pigments and black lacquer. Drinking alcoholic beverages, eating oat porridge or roasted oat dough. From Meigu County. Water buffalo hide bowls are made only in Huogumo Township, Meigu County. Water buffalo hide is first soaked in water for about a month, to make it soft and pliable. It is then cut into circular pieces, and each piece is formed around a wooden mold, and left to dry in a place exposed to wind but not sun. After about a month, the bowl is cut off the mold, trimmed, lacquered with black native lacquer, and painted with red and yellow commercial paint. 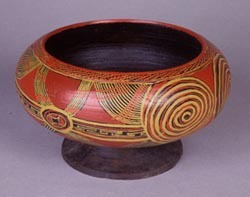 Bowl's interior is painted red which extends over the rim. Outside is painted with red and yellow paints over black background. There are three design fields placed over black showing the same pattern. Two pairs of "rams horns" are placed over and under a large black circle outlined by a solid yellow circle set inside a red field. The fields are outlined by two yellow lines, yellow dots placed between two red lines and a solid yellow line under the red rim of bowl. Bottom shows a large black center surrounded by a red line between two yellow lines, a thin red line and yellow broken waves in yellow over black. A thin red line travels around outer edge of bottom. Horn cut off of the carcass, lacquered inside and out with black native lacquer, painted outside with commercial paint. Outside and inside curve of horn decorated with identical pattern of four petal floral design inside a rectangular field. Tip of horn shows rings around horn painted in red and yellow over black background. Drinking distilled liquor. From Meigu County. This kind of large pot is used for drinking the weak, sweet, home-brewed beer made at the Nuosu new year. It is decorated in a typical Meigu lacquer pattern. 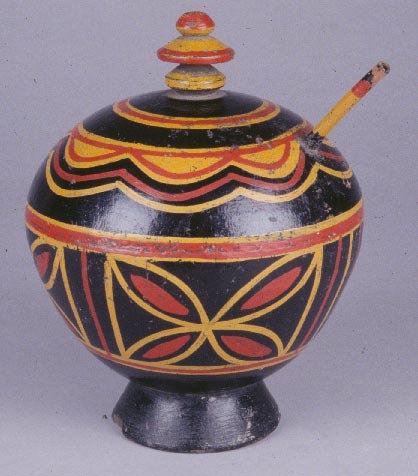 Large pot painted in dull red and yellow patterns showing "fingernail" design, floral and lines. A drinking tube is inserted near top of pot which ends in a stopper-shaped top. Pot is footed. Turned on a pedal-lathe in three or four pieces. Bamboo tubes inserted in bottom piece and through the top. Joined together with unknown substance, painted all over with native black lacquer, designs painted with commercial paint. Alcoholic beverage is poured in through the bottom, and sipped from the straw in the side. Used at New Year's for home brew. This pot for strong liquor displays the patterns of Meigu laquerware, typically simpler and less intricate than those of Xide or Zhaojue. This pot was probably made in the 1930s or 1940s. 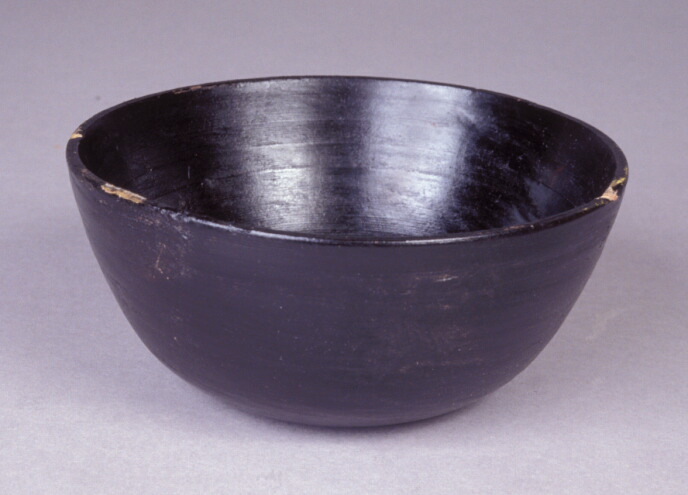 Painted, lacquered small wood bowl with steep sides, and slightly indented base. The dish is painted with the black undercoat only, the first stage in painting of these dishes. This material was collected from the Apu Cooperative (Nuosu ethnic group) in Laku Hamlet, Yilu Village, Yilu Township, Mishi District, Xide County, Liangshan Prefecture, Sichuan Province, China on Oct 27, 1994. 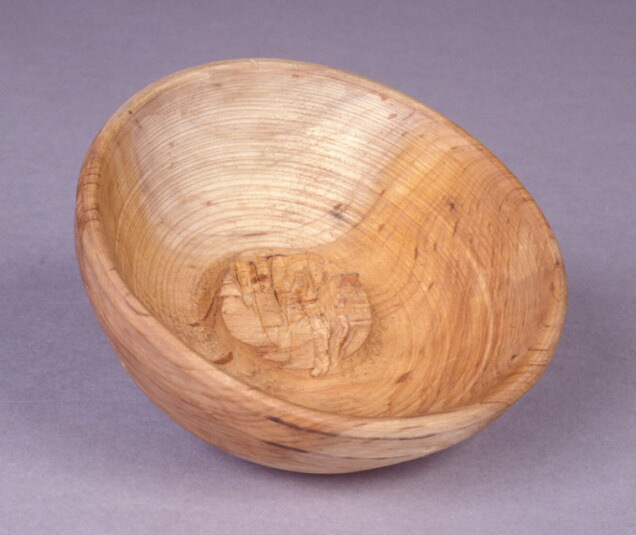 Lathed, unpainted small wood bowl. This bowl shows the stage of manufacture where the dish has been turned on the lathe to the point where the cones break off. The dish is then removed and the cones are carved off and smoothed down with adzes. The dish is then left to dry for a few days before painting. The cones are still visible in the interior of the bowl, and on the base. The wood is very aromatic. This is the bowl which the donor watched being made, and took photographs of it being turned on the lathe. Small carved wooden spoon or ladle, used for eating soup, rice, or vegetables. Handle and bowl carved from 2 pieces of rhododendron wood; the bowl is oval, and tapered to a point on one side. The handle has a flange where is joins the bowl, and is fitted into a groove cut into the spoon bowl. 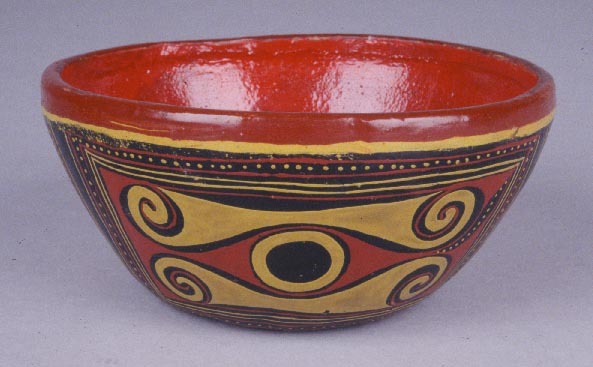 The interior of the bowl is painted black with a yellow center and rim; on the exterior red and yellow are painted over the black in a geometric pattern (concentric rectangles with yellow dots, and solid red and yellow areas). 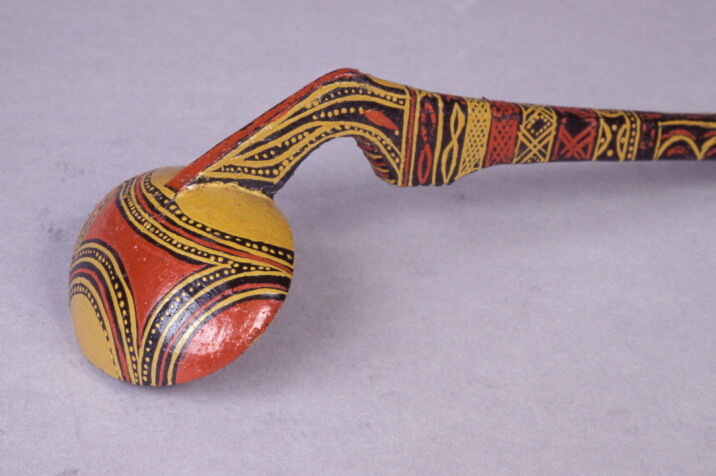 The handle is painted black along its entire length, and decorated on the sides and bottom with red and yellow geometric patterns. The proximal end is notched on the bottom, and incised on the top, and painted yellow and black. "Mountain Patterns" by Stevan Harrell, Bamo Qubumo, and Ma Erzi. 2000. Fig 4.1 pg 30. Painted, lacquered small wood ceti (rice dish) with pedestal and bowl. The bowl is shallow, round-bottomed with a wide flaring rim; the underside of the bowl is flat (7" diameter) and sits on a slender pedastal. The pedestal flares at the base to 6.5". The dish is painted with red and yellow on a black background. In the interior of the bowl is a red circle (1"di) surrounded by a band of 9 red half circles (3"di) on a yellow background. There are 3 concentric bands of design consisting of a red line with red half-circles, with the space in between painted yellow; some black background visible, this is the "fingernail" pattern. The design around the edge is a serrated band of red and yellow. The exterior sides are decorated with 2 main designs, painted in detail, with small ovals, lines, and dots in red and yellow against a black base coat. The black base coat has alomost entirely been overpainted with red. The base of the outside bowl section uses the "iron chain" pattern all around edge. (a very large "fingernail" pattern). The flat underside of the bowl is painted yellow. The pedestal is painted with large concentric serrated bands of red/yellow/red; the base is concentric band of half-circles in red/yellow/red on black background. Painted, lacquered wood kuzzur (soup serving dish). Dish consists of a low, wide bowl with a foot which is partially covered with black paint, bottom left unfinished. 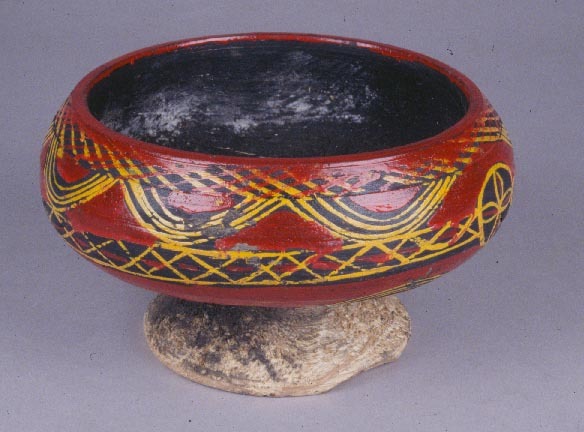 Inside of bowl is black, outside wall shows a red rim followed by a band of cross hatch pattern in red and yellow over black. There are two circles with a floral pattern within over black, the circles are on opposite sides of the bowl and are connected by a pattern of half circles in yellow over black, negative areas are painted red. This is followed by a band of yellow criss-cross pattern with a red slash through the "X". 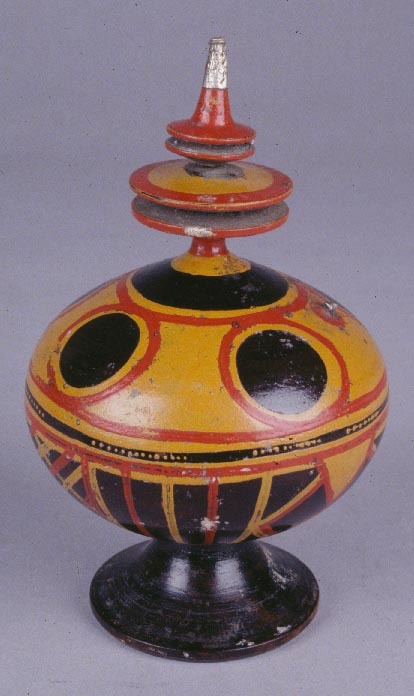 Half circles in several lines of yellow form the lower edge of decoration, underside of bowl is black. This material was purchased from a vendor in the market at Butuo county seat in November, 1999. For additional documentation, see the Lacquer section introduction. Painted, lacquered large wood kuzzur (soup tureen) with short footed bowl. The bowl is deep, globular yet flat-bottomed, with a narrower neck. The conical foot flares at the base to 6.4". The dish is painted on the exterior with red and yellow designs on a black background; the interior is solid black. 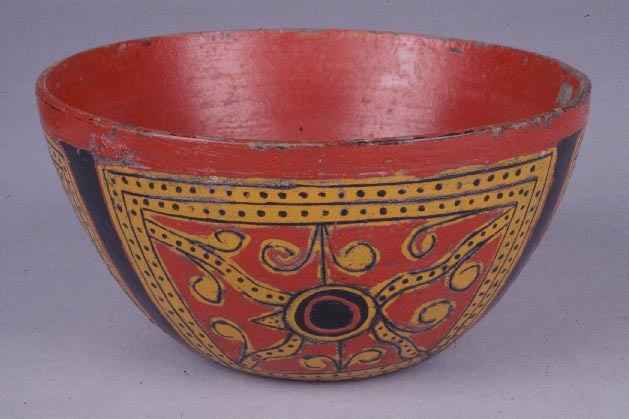 The exterior sides are decorated with 2 designs which are repeated on the opposite side of the bowl: Red and yellow spirals on a red background, with black highlights (cow's eyes pattern). Geometric grid of multiple yellow lines with red perpendicular lines, known as "fishnet" pattern. There is a central circular design in yellow and red over black placed between a band of geometric pattern in yellow over black (iron chain pattern) which extends from small circle to larger circles on both sides. A yellow and red straight line frames this pattern. Rim of bowl also shows sifhnet pattern in red over black 2cm wide. The very bottom of the bowl and the conical foot are painted black. Kuzzur are usually used for drinking broth from a boiled animal, such as a sheep, pig, ox, or chicken.
.: Home :. Clothing .:. Lacquer .:. Music .:. Religion .:. Silver . :.